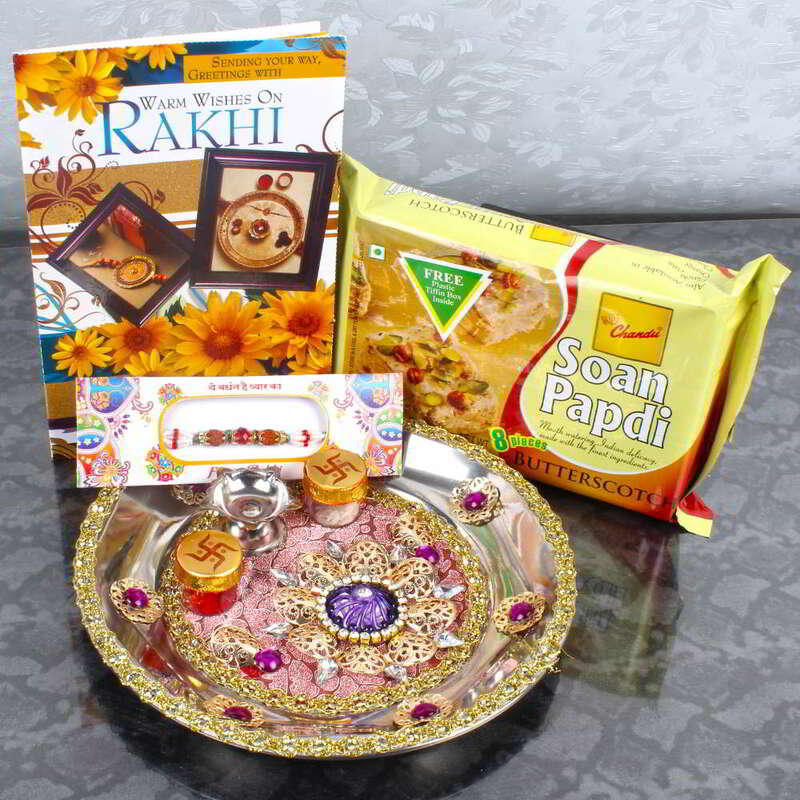 Product Consists: Designer Floral Rakhi Thali, Rudraksaha Rakhi, Roli Chawal, Butterscotch Saon Papdi (Weight: 200 gms) along with Rakhi Greeting Card. Exclusive Designer thali decorated with multicolored diamond beads work on its highlights the beauty of the thali. Raksha Bandhan is a festival celebrated by Hindus across India with much fervor. The designer diamond based the beauty of the thali. The design container of Roli Chawal masters the piece with an auspicious bead with diya embedded on the thali. Designer pattern enchants the beauty of thali. 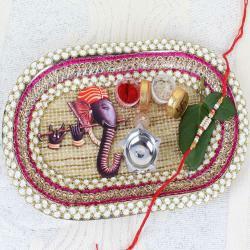 This Thali will be attractive to your brother on the occasion like Raksha Bandhan. Rudraksha Rakhi will also the motif with this thali which will be a huge surprise for you brother. Rudraksha is symbol of lord Shiva. 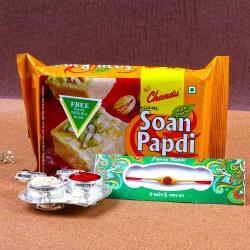 Your brother like soan papdi then this flavors like Butterscotch will like the most in this lovely occasion. 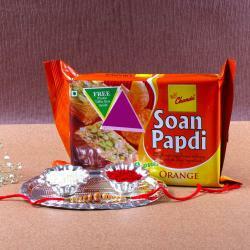 Rakhi Greeting will create a memory in future of this precious occasion for raksaha bandhan. 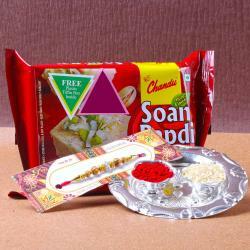 Product Includes : Designer Floral Rakhi Thali with Rudraksaha Rakhi, Roli Chawal and Butterscotch Saon Papdi (Weight: 200 gms) along with Rakhi Greeting Card.